LOS ANGELES, CA – July 20, 2011 –UCLA Anderson School of Management and a select group of business schools are offering the fourth consecutive Entrepreneurship Bootcamp for Veterans with Disabilities (EBV). Some twenty-four military personnel who were injured in the line of duty will receive education and training in entrepreneurship and small business management free of charge. The program, which runs between July 23 and 31, 2011, is designed to help participants learn essential skills that will lead to successful careers in starting, growing and managing entrepreneurial ventures. EBV applications are accepted from veterans with a ‘service-connected disability,’ as designated by the Veterans Administration, and who have served on active duty after September 2001. Candidates must demonstrate a strong interest in entrepreneurship, high motivation for owning and managing a business, and a commitment to completing the program. To date, more than 50 veterans from around the nation have graduated from the program since its inception at UCLA Anderson. The EBV was introduced by the Whitman School of Management at Syracuse University in 2007. The following year, the EBV Consortium was launched as a national partnership with UCLA Anderson School of Management, Florida State University’s College of Business and Mays Business School at Texas A&M. Purdue University, the University of Connecticut and Louisiana State University have since joined the consortium. The EBV is designed around two guiding principles. The first focuses on practical training in new venture creation and growth, including information on programs and opportunities specific to disabled veterans and the businesses that they own. The second focuses on establishing a support structure for graduates through mentoring and other forms of technical assistance. The UCLA Anderson EBV program is administered by the Harold and Pauline Price Center for Entrepreneurial Studies and is comprised of three distinct phases. Students develop their initial concepts during the online component of the program; participate in experiential workshops and in-class learning while at UCLA; and receive ongoing support and mentorship from UCLA Anderson faculty and alumni in the year following the residential component. With the generous support of corporate sponsors and private individuals, the entire program – including tuition, travel, and accommodations – is offered at no cost to the veterans. Note to journalists: Contact information for program participants available on request. Lance Cpl Robert Greniger 21. Lance Cpl Norberto Hernandez 22. Spec. Rafael Nieves 22. Army Sgt. Christopher Soderland 23. Army Sgt. Nicano Amper 36. Marine Staff Sgt. Thomas J Dodds Dudley 29. Army Sgt. 1st Clas Terry L. Parker 39. Army Sgt. Steve Talamantez 34. Spec Nathan Byers 24. Spec Nicolas W Newby 20. All members who died supporting combat operations in Afghanistan and Iraq, confirmed by the Defense Department July 8-14. Casualty totals 10. Wounded in action 150. October 10, 2001 to July 14th, total dead 1649 in OEF. 12,593 wounded. March 19th, 2003 to July 14th. 4462 dead. 32,153 wounded. All died protecting and defending the system of Government we are trying so hard to export to foreign soil. What wonderful role models we have walking the hallowed halls of congress. This is what is going on in the backrooms of the halls of Congress while you are mislead, misinformed, misguided, and just plain missed in the hearts and minds of these men and women with an abacus in one hand and a heart of stone in another. I believe, “take back the country,” is a ruse for anarchy, which is just around the corner. Especially in the community of veterans who actually did something for their country. Producing “soundbites” is not called something. yesterday at about 1730 hours the Amendment was tabled (functionally killed) by a vote of 69 – 30 in the US Senate. 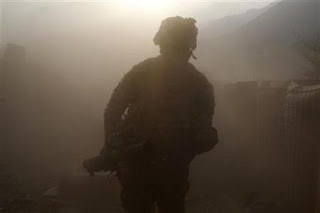 (Reuters Health) – Shortness of breath and reduced fitness among some military veterans returning from Iraq and Afghanistan may be caused by lung damage from smoke, sandstorms and toxins, a new study suggests. Researchers who performed lung biopsies on 38 veterans with unexplained breathing problems found a form of tissue damage — called constrictive bronchiolitis — that is rare in young adults and doesn’t show up in standard tests. In all but one case, a “lacy black pigment” also coated the delicate lung surfaces. Dr. Robert Miller of the Vanderbilt University Medical Center said the cases, which he has been gathering for years, are apparently caused by exposure to airborne toxins during deployment. “We believe they’re deployed to some pretty toxic environments. They’re exposed to burning solid waste, burning human waste (particularly in Iraq), and consistently exposed to fine particulate matter that’s easily inhaled deep into the lungs at a level that’s above what’s desirable,” Miller told Reuters Health in a telephone interview. Dust storms and combat smoke may also be a factor. Previous research has suggested that service in the Middle East increases the risk of breathing problems. Among the volunteers examined in the new study — primarily members of the 101st Airborne Division in Fort Campbell, Kentucky — most had long-term exposure to a sulfur-mine fire that burned for 30 days in 2003 near Mosul, Iraq, Miller and his colleagues write in the New England Journal of Medicine. In all, Miller’s team tested 80 previously fit soldiers who no longer met the Army’s physical fitness standards. Forty-nine agreed to undergo an invasive lung biopsy procedure after chest X-rays and other standard tests did not reveal the cause of their problems. All 49 had tissue samples that were judged to be abnormal. The diagnosis of constrictive bronchiolitis — a thickening of the walls of the smallest lung passages, the bronchioles — was made in 38 cases (35 men and three women). Seven were active smokers and six were former smokers. 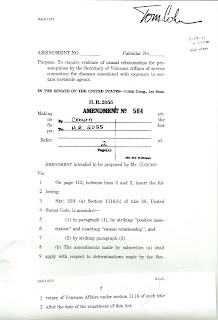 The Amendment sponsored by Senator Coburn (R-OK) has been tabled (functionally killed) by a vote of 69 – 30 in the US Senate. 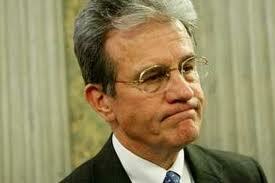 Would YOU want Senator Coburn providing YOUR medical care? Time for everyone to contact your US Senator, urging a “NO” vote on this damaging and totally unnecessary amendment that is intended to not only reverse the recent additions of diabetes, ischemic heart disease and certain cancers; but, also to undermine and/or “gut” P. L. 102 -4, which too many of us fought a ten plus year battle getting enacted by Congress and signed by Bush the First in February 1991. 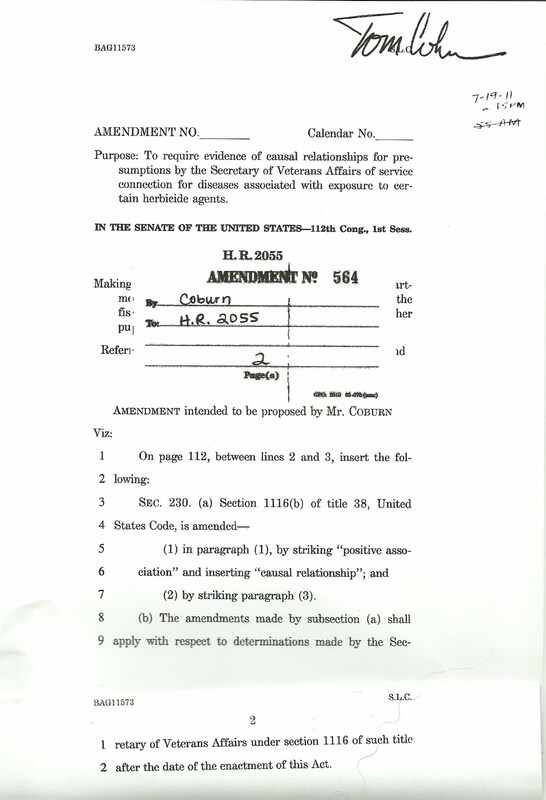 S.AMDT.564 to H.R.2055 To require evidence of causal relationships for presumptions by the Secretary of Veterans Affairs of service connection for diseases associated with exposure to certain herbicide agents. I reckon this is one of the key values of a Blog. The truth will surface through a dialectical process that does not really exist elsewhere. Plus these postings are quite frequently revisited unlike much of the daily print media that expires as sunset every day. One posting from June of 2009 about Vietnam Veterans dying prematurely, has more hits than any of the other 400 posts! I am sure this one will have a long half life. In April 2010 the 75th ABW, Hill AFB, Utah prepared in advance a press release describing the destruction of the remaining C-123K/UC-123K aircraft at the Davis-Monthan AFB. Throughout the period 2000-2010, intense concern was raised at different agencies, including the Office of Secretary of Defense, the Air Staff, the Air Force Surgeon General, the Air Force Office of Environmental Law, the Deputy Undersecretary of the Army, HQ Air Force Material Command and more. The concern: dioxin contamination left on the aircraft from their Vietnam War service as Agent Orange spray aircraft in Operation Ranch Hand. 1993 seems to be the first time when tests were ordered on Patches, the Air Force Museum’s famous C-123, was tested before positioning inside the museum. It tested positive for dioxin…in the words of the Air Force test it was “heavily contaminated”. More tests and correspondence abound during the period 1994-2000 with the only concerns expressed being the disposal of the aircraft, safety of personnel at the Boneyard, whether Walt Disney films should be told that two of the C-123s they purchased for movie production were contaminated, whether foreign governments should be informed that the aircraft transferred to them were contaminated, and similar correspondence. In 1996 the Air Force Office of Environmental Law recommended the contamination be “kept within official channels”, a recommendation endorsed by the writer’s commander, the Director of the Office of Environmental Law. In 2000 the Air Force joined with the General Services Administration in a court action to stop the contracted sale of some contaminated C123s. The federal judge took their evidence of the aircraft being “heavily contaminated, extremely dangerous, extremely hazardous, extremely contaminated” and other descriptions, and ordered the sale terminated. In 2009 the AMARG/AFMC moved towards disposal of the remaining 21 aircraft, but they couldn’t be buried as they were too toxic for a landfill. The recommendation of the Office of Secretary of Defense (Dr Alvin Young, Senior Consultant) was to stop testing the aircraft immediately for toxicity…two of four had tested positive and his suggestion was that that result could be taken two ways.that “only two of the 21 aircraft were toxic”, or that “50% or more of the remaining aircraft were toxic.” As the testing was costly, Dr Young and base officials, acting on Dr Young’s authority from Office of Secretary of Defense, opted to shred the entire fleet of C-123s, having learned that shredded metal does not fall under EPA guidelines as did the aircraft…and there was a threatened $3,000,000,000 fine. And there were the comments by Colonel Schneider at DM, who told the 75th ABW “he is concerned with the potential dissemination of information”), and museums which wanted them, and private buyers who wanted them so desperately they unsuccessfully sued in federal court to try to force a sale. In conclusion, a press release was crafted by the PA shop at the 75th Air Base Wing. It was not distributed, but held in case of media inquiry. This was a further element of the effort to minimize public awareness of the true story of the event. No lies were told. Mistruths were constructed, however, to build a story which really had nothing to do with the real news of the event…dioxin contaminated aircraft. Nobody at the PA shop inquired of the managers of the event about the Air Force Reserve aircrews which had been exposed to dioxin on their airplanes for a full decade. Instead, the public affairs officers bent without objection, indeed, apparently with eager willingness, to construct a press release to deceive the media and the public, as well as the Air Force Reservists beginning to wonder why they have cancer, heart disease, acute peripheral neuropathy, ALS, and other dioxin-related illnesses. While note part of the public affairs activity at either base, I note a possibly inappropriate use of a business title implying official actions within and by the Office of Secretary of Defense. Dr. Alvin Young was cited in several documents from HQ AFMC and the 75th Air Base Wing as Agent Orange “Senior Consultant to the Office of Secretary of Defense.” He used the title himself in memoranda, and his name and title were cited as authority for the decision by AMARG to shred and smelt 21 surplus C123K/UC-123K aircraft in 2010. Further, his attitudes and reactions to Reserve Component aircrews are a specific concern, as in his position paper regarding the need for speedy destruction of the dioxin-contaminated aircraft, Dr Young mentions the media “storm” which might attend the operation and cause aircrews and maintenance workers with dioxin-related illnesses to seek care at the Department of Veterans Affairs. Concerned with the visibility of this event, which he frequently writes must be low key (and even congratulates base officials on concluding the operation with minimal public attention). There has been an obvious, skillful twisting of words to hide the actual event…destruction of dioxin-contaminated aircraft with a potential $3 billion dollar EPA or State of Arizona fine…by presenting a completely misleading press release. There is an ethical standard in preparation of press releases, but it was ignored here. Dr. Young, who last week described the dioxin-exposed Air Force Reserve aircrews as “trash haulers, freeloaders looking for a sympathetic Congressman for tax-free dollars” seems an inappropriate person to be editing Air Force press releases especially when he helps direct the misinformation concerning events vital to my health….my friends and I flew those airplanes! Thanks to various military-oriented editors and reporters, this story has changed quite a bit from what it could have been – the simple “destruction of Agent Orange contaminated aircraft in an environmentally responsible way” to one where the news value is in the early attempts to keep the information in official channels, to one where Air Force public affairs abused the trust of the public and media by misleading them through a poorly-crafted and deceptive press release, and where public affairs at both Hill AFB and Davis-Monthan AFB failed to bring to the attention of leadership their ethical responsibilities, and to alert their leaders as to the negative impact that failing to notify aircrews who’d been exposed to the toxins and the health dangers this press release was designed to conceal from us and our families. Spiritual wounds that are still unhealed? This weekend may be the start of a new journey for you and your spouse or significant other! Call the number on this flyer and register, scholarship help is available! Did you wonder where God was while this traumatic event was happening? Do you have questions about forgiveness? Do you find yourself estranged from God and those closest to you? Do you feel spiritually dead? Is part of you waiting to come home? Twenty-five, thirty, forty, fifty years after their experience with trauma. Survivors still have lots of unresolved questions. Spouses and significant others have questions as well. This weekend will provide an opportunity to raise some of these questions and explore possible avenues to a new life. Father Phil Salois, M. S., National Chaplain of the Vietnam Veterans of America, served as a foot soldier in the 199th Light Infantry Brigade around Xuan Loc. The Reverend Dr. Alan Cutter was assigned to the Naval Advisory Group in the First Coastal Zone, working around Danang and points north. Dr. Cutter is a Presbyterian Minister. Sister Linda McClenahan, OP was a Sergeant working with communications in the southern area of Vietnam. Sister “Sarge” is a Racine Dominican Sister. Reverend Dr. Jackson H. Day, a Methodist Minister, served as Chaplain to the Fourth Infantry Division in the Central Highlands of Vietnam. Join these veterans for a weekend experience you won’t soon forget. This mans name is Wesley Carter. Lets see if any of our readers have some relevant feedback. The 505th at Hill AFB and AMARG Davis-Monthan AFB, AZ together manage the Air Force’s fleet of stored surplus aircraft. In 2010 their collection of Vietnam-era C-123K/UC-123K were destroyed due to the dioxin contamination which remained ever since their last wartime spray mission. The 505th Public Affairs staff worked with consultants who were particularly sensitive to the “Agent Orange” and “dioxin” power-packed words and the publicity likely attendant to such an event, the only time the Air Force had ever been forced to destroy surplus aircraft by shredding (because shredded metal does not meet EPA guidelines for contaminated materials, thus avoiding a threatened $3 billion fine) and then smelting to destroy the dioxin. Along with friends, I flew the C-123K for ten years 1972-1982, and beginning in April 2011 started reading about the aircraft’s history online, and submitting FOIAs to see if this is where so many of my unit’s veterans are getting Agent Orange-presumptive illnesses. I found, in particular, test after test establishing the aircraft remaining “heavily contaminated, extremely dangerous, extremely hazardous, extremely contaminated”…the Air Force laboratories’ words. But I also found a 1996 recommendation from the Air Force Office of Environmental Law to “keep this information within official channels only”, channels which apparently have never included us as aircrews. Along with other Stan/Eval flight examiners, I was supposed to be one of the most expert, most qualified, most experienced, most reliable flyers in my crew specialty…but I never was informed. The only “conversation” I eve had with the Air Force was about the stink of the airplanes when I first started flying them in 1972 and was told it was left over from Vietnam. The press releases dealing with the destruction of 21 aircraft were crafted to keep the words in proper English and to discuss an event, but it was “word-smithing” to use true words for telling a lie. In all the AF documents the reason the 21 aircraft were destroyed was because of the dioxin residue – in the press release the aircraft were destroyed because they were aged Vietnam-era airplanes no longer flying, and the words first used in press release drafts “Agent Orange” and “dioxin” were replaced with the less-threatening and less- attention getting “herbicide”. Lies with truthful words. The press, supposed to rely on the basics of a military unit’s press releases, was completely misled. We have among our flyers started a blog to post all the documents we’ve been piling up from the Freedom of Information Act. Tom Philpott of Gannett did a nice story about us at the end of May but did not touch on the false press releases…at that time we throughout the old airplanes were still sitting in storage at Davis-Monthan’s Bone yard. Can you help? The VA is denying that we’ve ever had Agent Orange exposure, even though the Air Force’s own lab tests over 30 years say we flew contaminated airplanes. I feel this has both editorial and news value…I want the story driven! Forgive me for being a bit retail, but I know all these retreat folks and serve as a mentor for some. I determined that the more the merrier, as the mission is to find and heal as many returning veterans as possible. In an ideal world there would be on Retreat Center in every state. Provides veterans, family members, helping professionals and caring community members an opportunity to learn and practice ways of successful homecoming and healing from war. Dr. Tick’s Book, WAR AND THE SOUL. START AND END TIMES: Registration begins at 3 PM Wed. Aug 24, opening ceremony at 7. Program ends on Sunday Aug 28, with lunch. I attended this most potent and healing retreat when it was last in Tucson. I will be at this one also in October. We can arrange for rides if needed. It is worth it. Should anyone wonder what these two entities have in common, it is loyalty to the community and incredible camaraderie. It was only recently that Tucson Electric Park elected to return to the original name of the park, Veterans Memorial Stadium. That is the name the voters were given to sell the bonds. As soon as the park was completed the name vanished in the cloud of corporate sponsorship. They could well have melded the two names together. Should there ever be a stadium to host a local team and International matches, soccer would not be that disloyal to the population of veterans who delivered the vote to build the facility, that now, quite ironically will need soccer to gain solvency. That is karma squared. As the former Director of the Pima County Sports Authority, I watched the good ole boys of Tucson manipulate the socks off its citizens to insure there was no egalitarian approach to other sporting entities in Tucson. It was baseball or nada. The irony being that we were all baseball fans. I was a bat boy for the Cleveland Indians in 1959! Sports marketers will inform you that the probability of a soccer player being a multiple sport participant both as fan and and rostered player is quite high. When I was trained by the National Association of Sports commissions I learned that cross marketing with soccer is a wise move, as you capture a huge population. The ratio of youth soccer players in Southern Arizona, to other sports is nearly 5:1. Add stereo parents and a few family and friends, and you hit a population of approximately 75,000 before you leave the gate. Who else can deliver that kind of package? In my travels I visited the Rochester New York Rhinos USL Soccer Franchise and attended one of their matches at the Triple A Ball park, before they built their own stadium. 16,000 fans were in attendance. And who owned them? A local entity that owned the baseball and hockey franchise. Magic eh? Cross marketing to the max. A trinity of promotion that spanned the entire calender year. I shared this concept with the Economic Development Office of the City of Tucson on multiple occasions, with the first being 1998. Never once was there a response. It now appears that the right people with the “right stuff,” are at the table. I stand with great enthusiasm and anticipation that the city officials will see the opportunity that will last a lifetime in Tucson and leave many of our citizens smiling and proud to be supporters of FC Tucson and its tentacles that will bring Tucsonans together with esprit de corps. Since the success of the Inaugural FC Tucson Desert Cup in March, where over 10,000 fans watched two MLS teams compete at a sold-out Hi Corbett Field, MLS officials and teams have taken notice of Tucson’s love for soccer. Added to Tucson’s reputation for hospitality and unrivalled climate, MLS is exploring the possibility of coming back to our community in force. Major League Soccer’s swelling popularity nationally over the last two decades makes it an escalating economic force. This has drawn the attention of communities throughout the United States – many of which are now actively courting an MLS presence. Tucson, while not yet viable as an MLS expansion franchise city, is uniquely positioned to offer something league officials have expressed desire in achieving: a West coast hub at which MLS teams can train prior to the regular season. While MLS spring training is a concept still in its infancy, this concept is maturing rapidly, and some civic leaders have the foresight to explore the possibility of developing a mutually beneficial relationship with MLS. After the abandonment by Major League Baseball of a multi-million dollar facility built for their use, our community has been left with an economic and social void. These facilities can be used by MLS with limited conversion costs. MLS, while smaller than Major League Baseball, will provide Tucson an opportunity to get in on the ground floor of a growing sport. The presence of many MLS teams and their fans in our community over a 2 to 8 week period in the spring would create an economic benefit for local businesses as well as a general social benefit to all. Events are planned throughout Tucson over the next three days to demonstrate Tucson’s interest in developing a relationship with MLS. Members of the media are invited to join us on this journey beginning this Friday morning, when Mr. Rodriguez arrives. There will be an opportunity for interviews at FC Tucson’s final home game Friday night in Vail at 8 p.m. and a special breakfast on Saturday for members of the media to speak directly with officials from FC Tucson, Tucson and the MLS. FC Tucson, established in 2010, is committed to bringing the highest caliber of competitive soccer to Tucson and becoming a lasting, highly successful source of pride for Tucson. Our players, coaches and staff are committed to winning Championships and recognize that our success on the field reflects on our fans, our sponsors, and our community. As the sitting Commandant of a Marine Corps League, I like this mans response, yet I must add that I believe that most of the Marines I know and associate with our some of the most humble men I know. I think Toys for Tots defines us as much as our War bonnets. I wrote this in response to an Army guy on Facebook who posted a comment on our Marine Corps site that he was sick and tired of Marine “arrogance”. As it would to any Marine, it piszed me off some and I posted this. I hope you enjoy it and feel free to repost it wherever you would like. Thank you and Semper Fi! Marc Ciacchi. I think that what makes Marines special, if only in our own minds, is that elusive Quality of Espirit D’Corps. It’s the fact that we, as individual Marines, don’t feel that we are individual Marines. When we wear our uniform, when we hear our Hymn, when we go into battle, we are going with every other Marine who ever wore the uniform. Standing behind us are the Marines who fought during the birth Of our nation. We’re standing with the Marines who fought in WWI and gave birth To the legend of the “Tuefel Hunden”, or “Devil Dogs”. We are standing with the Marines who took Iwo and Tarawa and countless other blood soaked islands throughout the Pacific. We are standing with the “Frozen Chosin” and our Beloved Chesty Puller. We are standing with the Marines who battled at Hue City And Khe Sanh and the muddy rice paddies of South East Asia. We are standing With the Marines who fought in Desert Storm and Iraqi Freedom and now, are fighting in Afghanistan. Like real brothers, their blood courses through our veins, and when we go into battle, we would rather lay down our lives than be a disappointment to them. We carry on our backs, their legacy, their deaths and their honor. We Carry that for the rest of our lives. The Marine Corps uniform doesn’t come off when our active duty is over. We wear it daily in our attitude, and our love of Corps and country. We wear it on our tattoos and our bumper stickers. We wear it in our hearts. It’s why, no matter where we are in the world, on November 10th, every Marine celebrates the Marine Corps birthday. It’s why we’ll never be an army of 1. It’s why, in a crowd of service men, you can always spot the Marine. Why are Marines special? I don’t know. We just are.